Family - Family of flowering plants can be divided into following – Asteraceae, Orchidiaceae, Solanacaea, Fabaceae, Rubiaceae, Poaceae, Lamiaceae, Euphorbiacea, Mealastomataceae etc. Leaf – Arrangement of leaves with reference to the stem is called phyllotaxy. It can be whorled (leaves are borne three or more in number at each node), opposite (leaves are formed in pairs) or alternate (single leaf is initiated at each node). Root - Roots can be of mainly two types – primary root (it is the root which consists of main root and lateral branches of lateral root) and adventitious root ( roots that are arise from other than radical is called adventitious root. But in some special cases modification of roots are observed. Stem - Stems are portions of shoot that bear branches, leaves, flower, fruits in their proper places. They are weak, hard, green or brown. Shrubs are having weak stem, stem of herbs are used as medicinal or flavouring agents, trees are having, brown woody hard stem. Stems of some plants are similar like leaves they are called cladophylls. Examples are Asparagus. Some stems can also formed bulb like structure such as corn. Floral features – According to presence of number of whorls (calyx, corolla, flowers can be complete or incomplete. Flower – According to shape flowers can be symmetrical ( can be cut into equal halves), asymmetric (cannot be cut into two equal halves). According to presence of male flower and female flowers it can be of two types – monoecious and dioecious. Calyx – calyx are consists of sepals. They can be joined or bifurcated and epicalyxes may or may not be present. Corolla – petals are associated together to form corolla. It can be of different shapes like bell, funnel, tube shape, wings shape etc. Androecium – It consists of pollen tube and anther. Gynoecium – gynoecium consists of ovary. According to position of ovary it can be of different types- superior ovary, inferior ovary. Fruits - Fruits can be generally divided into simple (developed from a pistil of a single flower), aggregate (developed from single pistil of different flowers), multiple fruits (developed from an inflorescence axis and pistils of flower associated). Fleshy fruits can be divided into different types. They are drupes (endocarp is stony and tightly adherent to the seed, examples are peach, olive, plum), berry (endocarp of the fruit wall is fleshy and exocarp is skin like, examples are dates, grapes etc), pomes (endocarp is tough and membranous and edible part is not the part of food , examples are pear, apple). Seeds - Endosperm of the seeds can be oily or non oily. Floral formula – this includes different signs, symbols and number to express the type of flowers. 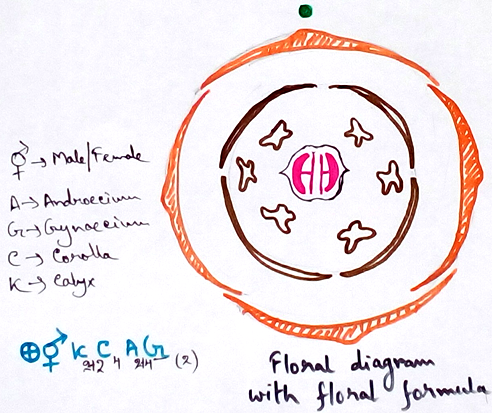 Floral diagram – It represent the origin, evolution, position of different parts of flower. From the floral diagram we are able to know about the entire structure of the plant in short.